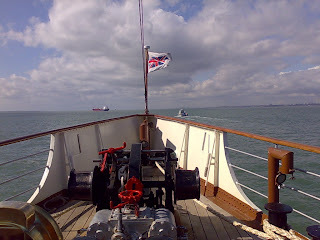 I've had requests for me to blog the results of our weekend racing, so I will return to the Waverley tomorrow. This weekend was the last race of the season and despite racing my road car we have actually done quite well. So much so we had a chance at the championship this year. In the first round of qualifying Tet made it to number one qualifier. After the second round we had slipped to number two, which was still pretty good. Unfortunately in the third and final round we slipped further to fourth place. That did make things much harder, but there was still a chance Tet could win the championship. After the first round of eliminations the three teams ahead of Tet in the championship were all out. That was hopeful, but it meant we had to race one of our friends. Poop, we would rather have met him later in the day, and the winner of that race would be straight through to the finals. The race was very close with both drivers getting off the line well, but at the finish line Kevin was just ahead. It did come down to inches and 2.9 milliseconds. You don't get much closer than that. It would have been good to have got further but at least it meant we had a friend in the final. 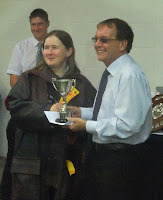 However we didn't manage to win the championship so we will still have to pay entry fees next year. I guess we have to try harder. On the other hand we did have one success at the track. Tet finished and delivered another quilt. The Welsh flag in the picture is a quilt. It is standard quilting cotton fabric on the front and a velvety fleece on the back. 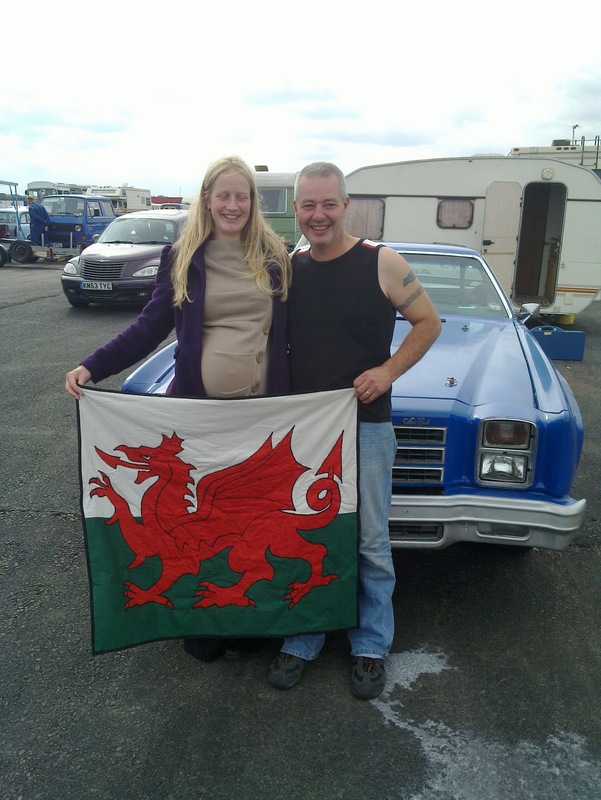 The soon to be parents are Sean and Suzie Armstrong who are Taffy Bear racing. That is their race car trying to hide behind them, I insisted the whole race family needed to be in the photo :) and I'm afraid I chose the picture where the car looked it's best. I think they will understand, and the bump is getting in on the photo too. There was some concern that that little one would try and put in an appearance at the racing this weekend but it managed to hold on so it hasn't seen it's quilt yet. The quilt is waiting in her hospital bag so the little one will be able to go home in the welsh flag. 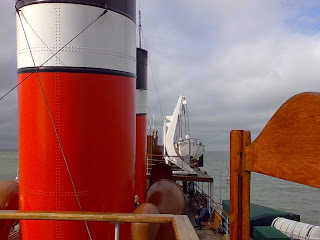 For my birthday last year Tet gave me a voucher for a trip on the Waverley, and since then we have been trying to find a trip fairly local to us and on a day we were both free. That was tricky and last year I couldn't manage it. Monday was the only date that worked this year so we went for it, despite it being directly after a race weekend. The early start wasn't exactly fun but given it was this trip or nothing we were determined to be there on time. Things went well until we got to Victoria where we discovered our train had been cancelled. Not ideal, but not a problem. We had planned for that and the next train would still get us to the boat in plenty of time. Well had it been running on time it would. It arrived late to Victoria, but made up some time immediately by loading quickly and heading off again. Unfortunately it lost that time and some more on it's way back to Margate. The Waverley was due to leave Margate at 10.30, and our train finally arrived at Margate station at 10.29. We had called ahead and asked the crew to wait for us and we had booked a taxi. The taxi was waiting for us and did his best to get us to the 'pier' on time. He would have managed it too, if someone hadn't stopped in front of us blocking him. Our only remaining option was to run for it. 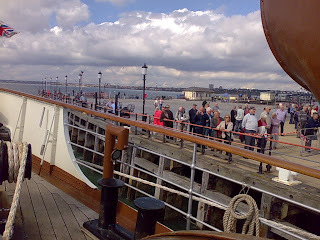 As we were running towards the Waverley they took in the gangways, but at the last second they did see us running towards them waving and put one back out for us. You know, waving and running at the same time is quite hard work. Just as well there are seats all around the deck so we could stop and catch our breath. It did mean we mostly missed pulling away from the 'pier' but hey we made it, just! I'll have much more understanding when I read "Around the World in 80 Days" next. 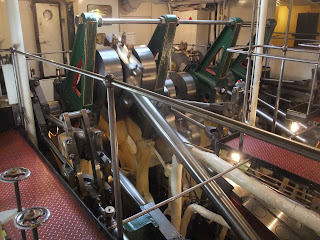 Once we had our breath back the first stop had to be the engine. I had forgotten how good it smells (well to me at least) but the sound and the heat had stayed with me from my previous visits. There is a very special sort of heat around engines and I love it. It is also just mesmerising to watch moving. I will try and upload some video of it soon. 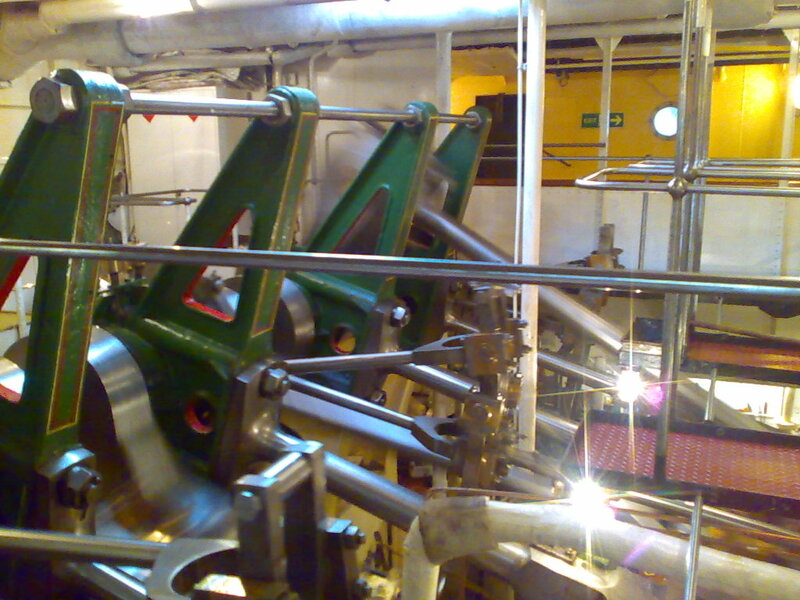 I hadn't really thought about it before, but I guess it's quite rare to be able to get this close to a moving engine. I'm glad it's still allowed. 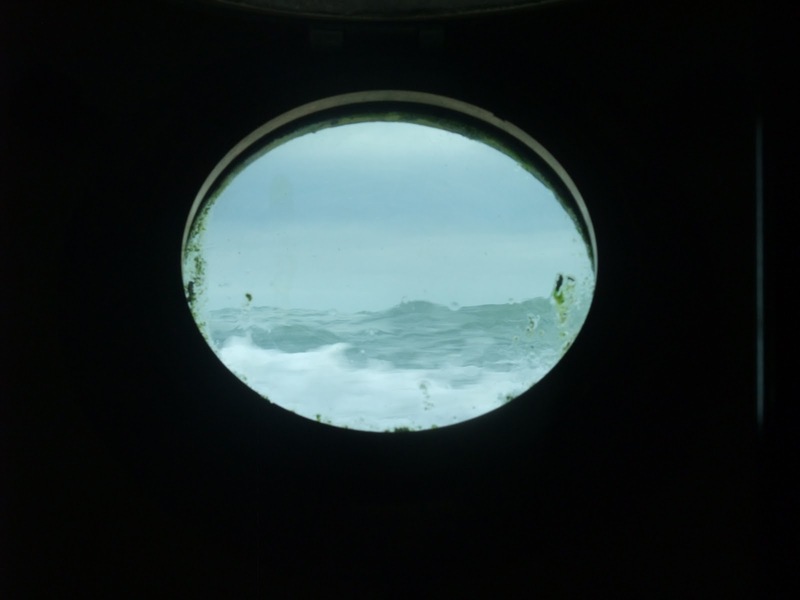 When you are next to the engine you can look out of the portholes and see the paddles moving. It makes it clear why she isn't the most manoeuvrable vessel in the world. When her paddles are going they are both moving together. Great for propulsion but it would help her turn if they could be slowed independently. 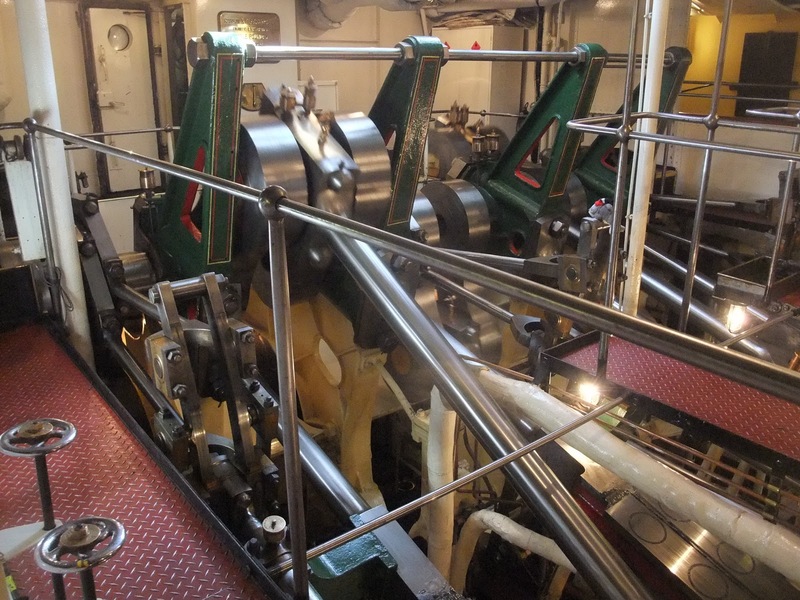 They do give her great acceleration though and when she leaves a dock she does it very very quickly. The next stop on our exploration of the boat was the lower bar. When they say lower they mean it. this is the view from the portholes in the bar. They are above my head height when sitting down and as you can see they are pretty much at sea level. I would guess that later in the journey when we had taken on many more passengers they were even lower. I really enjoyed watching them as it gave a great feeling of movement. 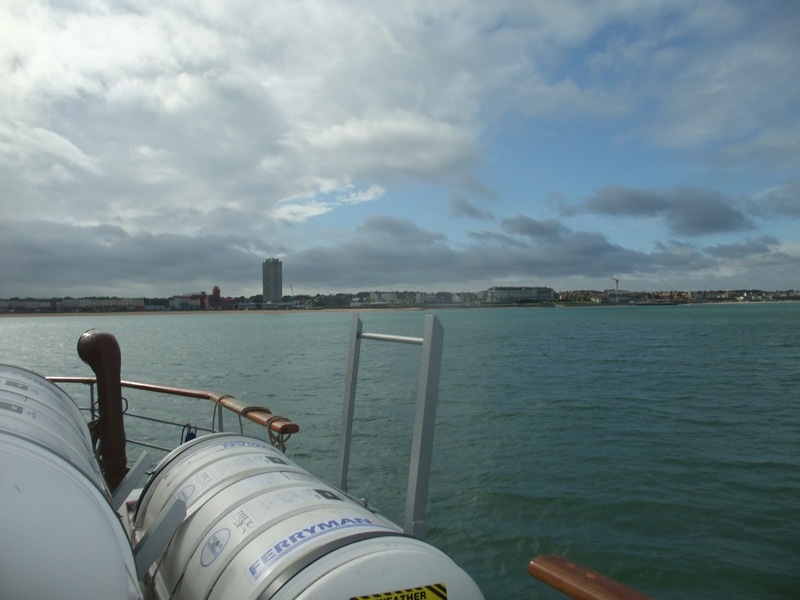 From Margate we headed out around the Kent coast towards Herne Bay. 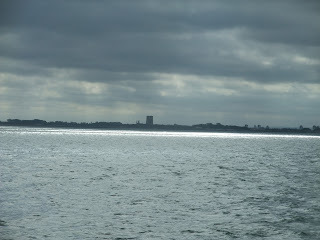 This took us past a wind farm and Reculver. 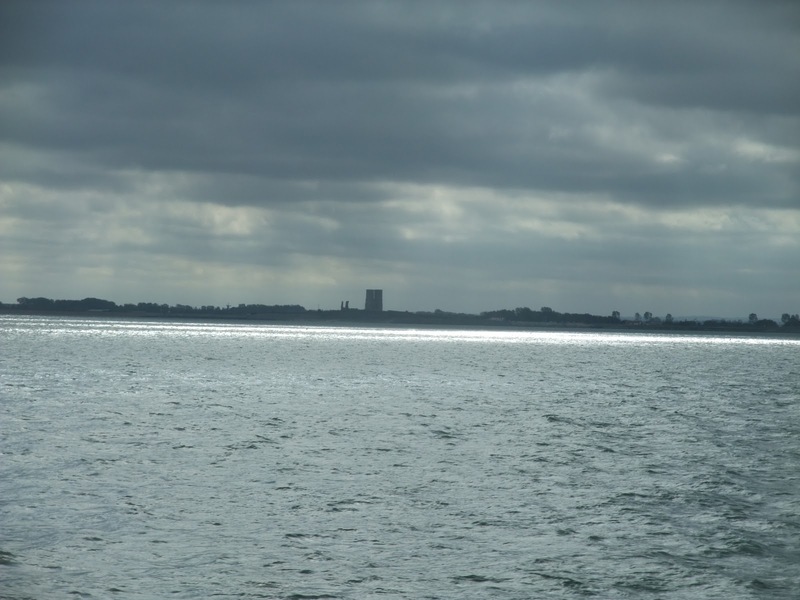 When we were at university we often visitied Reculver, and had often read about how important it had been. You really appreciate how imposing it is when you see it from the sea. It was still clearly visible when were ready to turn into Whitstable. The towers of St Mary's church, Reculver are the blocky towers in the middle of this picture. The lower structure to the left of them are the ruined back wall of the building. The next stop on our trip was Whitstable. This is somewhere we were both very familiar with from university and we had lived in the area for a few years after graduation. However we had never approached it from the sea. I hadn't expected the harbour to look so enclosed, it doesn't from the land side. It also seemed a lot smaller than it had. 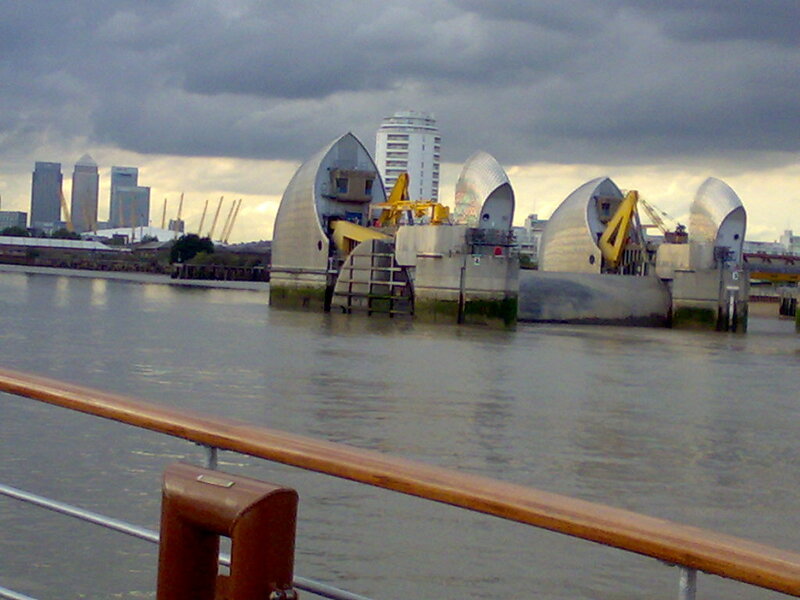 I have seen several ships being loaded with gravel, and they looked quite large. The Waverley on the other hand looks quite small and seemed to take up a lot of room in the harbour. Given how small the Waverley looks the queue on the dock was quite a surprise. She can actually carry 860 passengers and on Monday was just 6 short of a full load. It does make it quite hard to move around so I was very pleased we had taken the time to look at the engines while there were less people on board. As soon as we left Whistable we headed down to the dining room, thinking that the new passengers would look around as we had done. 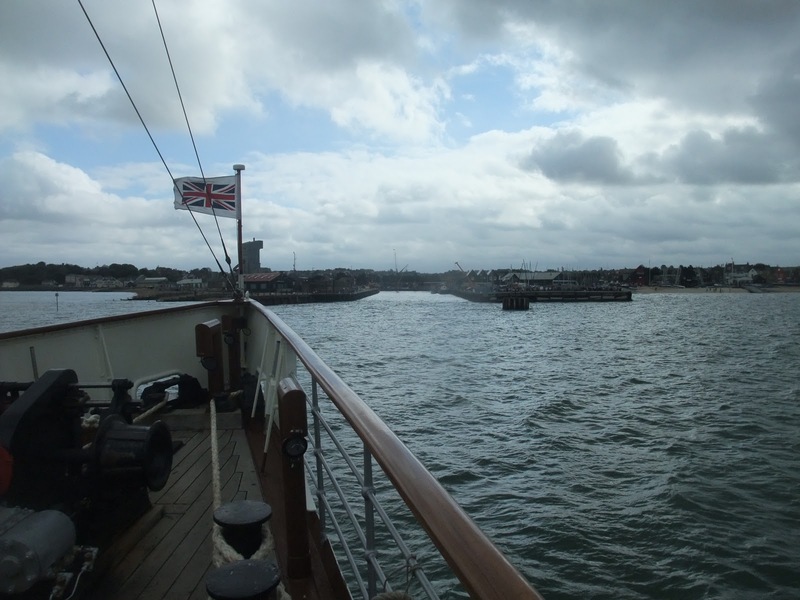 Sadly we weren't that lucky and had quite a queue for lunch (which is actually a very good thing for the Waverley she is run as a charity and all the profits keep her sailing). The food was good too, although it was the strangest haddock I've had it was tasty. 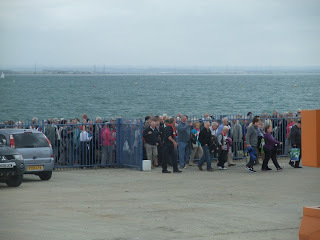 After Whitstable we headed on to Southend, which was one of the places I blogged from yesterday. All the way we were given information about where we were and what we were seeing over the PA. 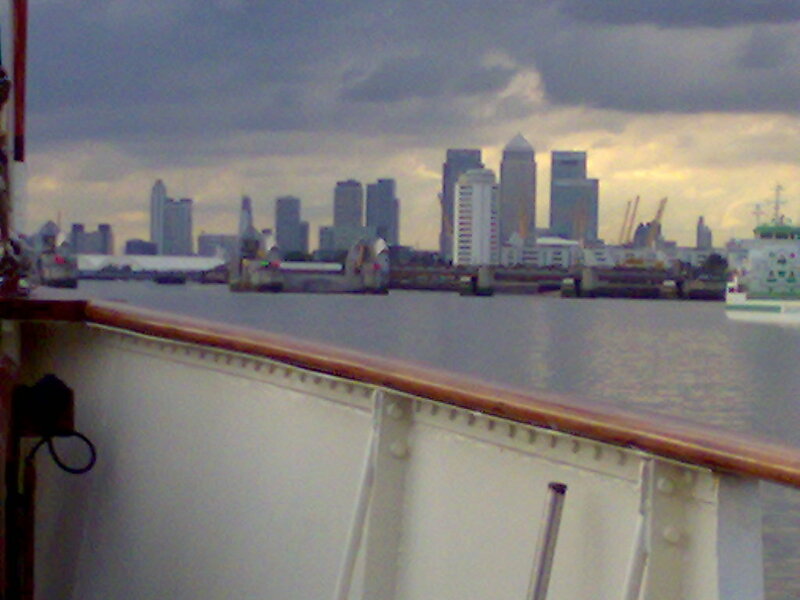 It was great to hear about the other vessels we passed. Some of them had almost as much history as the Waverley. 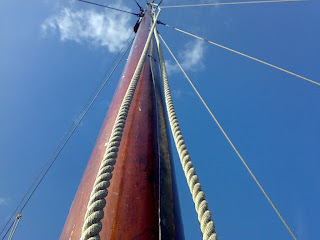 I really enjoyed learning more about the history of the coast too. I think that had better be all for tonight, given I am teaching tomorrow. I'll try and finish off tomorrow. If you are trying to get onto my main website ferfab.co.uk and having problems it isn't you. My server seems to have gone to sleep. We are working on it and I should be back online shortly. If you need to contact me a comment here will get through to me. It turns out that server had a faulty power supply so for the moment is dead. However, we have other servers so the web site is now back up and running. Sorry for that folks. On the other hand I have a lot less downtime now we have our own machines so I really can't complain. Anyway, normal service has been resumed. 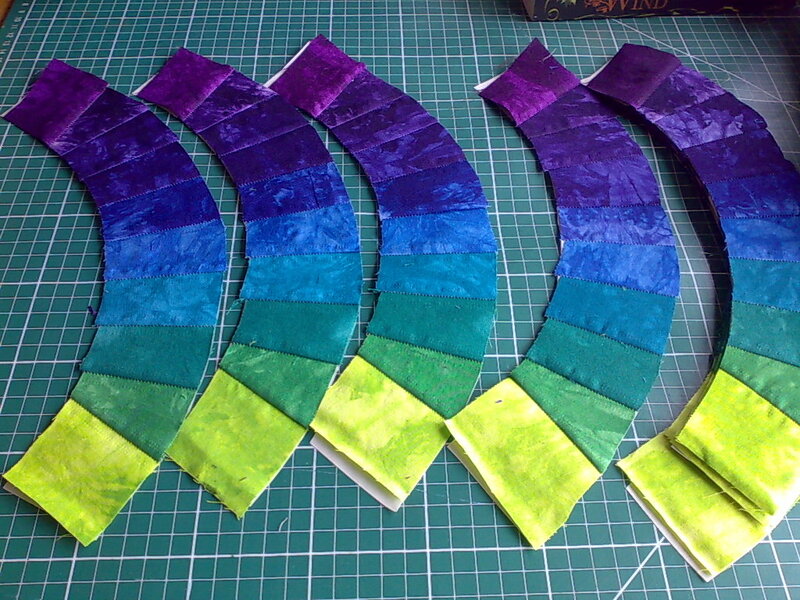 I've got the first batch of the other colour of rings done for the double wedding ring quilt I am making. I am hoping to get a few blocks made so I can see how the colours are working. 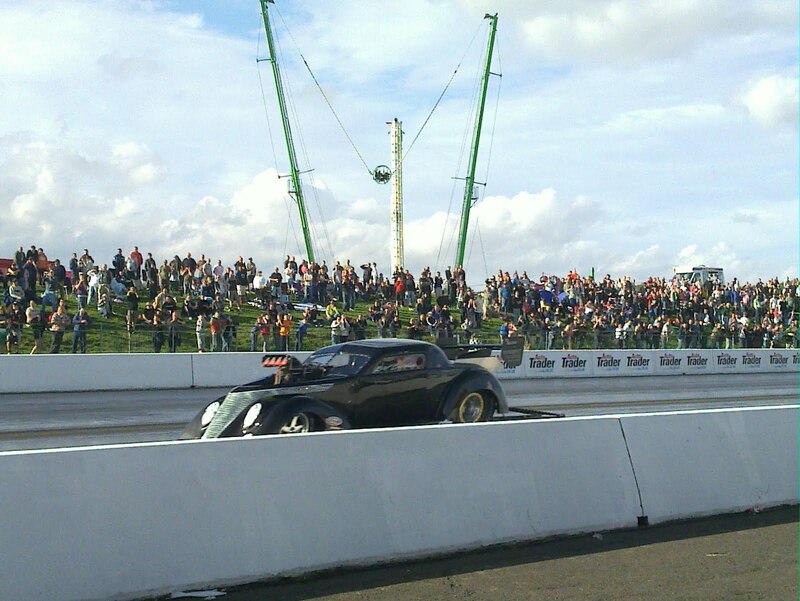 The racing is going OK. We would have liked to stay number 1 qualifier, but number 4 isn't too bad. 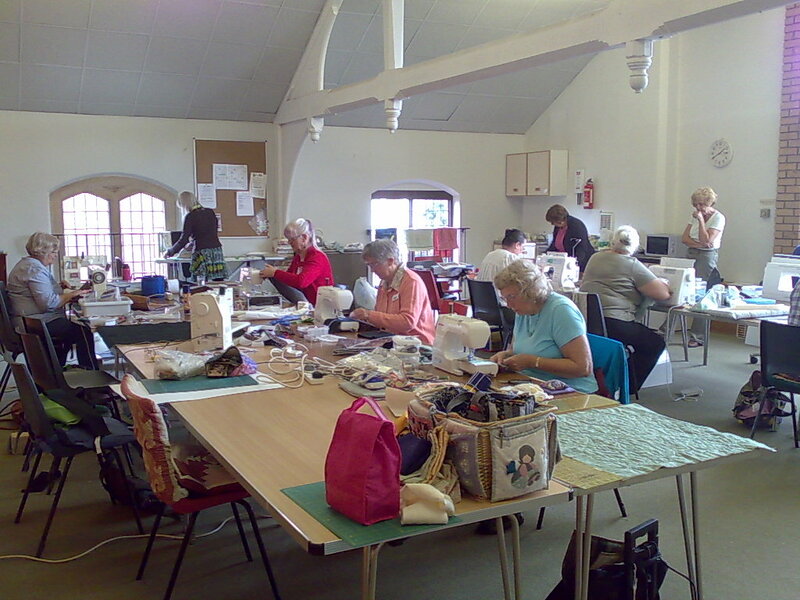 Due to some mishaps this morning our class hasn't raced yet today hence the sewing. I guess we will be called if I get set up for the next piece i wnt to make. This is another question I get asked a lot. I generally answer, everywhere. I find inspiration lurking in all sorts of places. Buildings and cars are particularly likely to catch my eye, but really anything can trigger a quilt design. My students are especially likely to send me off on a design. I guess thinking about quilting makes me more likely to pick up a stray comment (or in some cases just a word) and turn it into a quilt design. It started with one student needing a quick, simple and striking quilt (with the option of quilt as you go). On her lap was one of my other quilt designs. After kicking the ideas about for a few minutes we have a design that will do the job, be quite fun to make and I suspect will one day appear as a pattern. Then the students moved on to what they would like to be taught. This is how my book 'Ferreting Around' happened. They gave me a list of requirements and I built a quilt from it. This time though they want to learn techniques and make maybe cushions or bags with the samples. OK, I can do that but it leaves me cold. So I start kicking the ideas about. They came up with several good techniques, and then I spotted a theme in them. It wasn't quite there and it wasn't fully formed, but there was a pattern to the subjects (mostly) and I could work from there. By the time I got home I had most of a quilt planned. It will use all the samples to make a lap (ish) quilt. Cool. It will meet their needs and not make me feel like I've been producing samples. Unfortunately this is the sort of design where I need to get some diagrams onto paper to be able to see the sizes, but I'm really busy. I am planning on being at the race track this weekend but both vehicles are playing up. Also having lost a day this week to being ill I've got a lot of catch up work to do. Well what do you know, my internet access was down when I got home, so while I waited for dinner I was forced to make some design notes. I guess the world felt the new quilt idea was more important than all the other stuff waiting for me. I've got a little break between customers so I've gone back to my monster wholecloth. 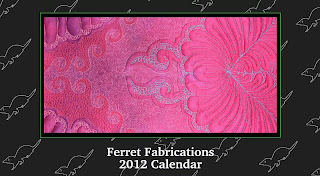 Those of you with 2012 calendars will know it has a name. Prometheus. I've finally decided how to tackle an area I had left which in turn had made the quilt much harder to tension on the frame so I am going to do that for a while. The area that is now being filled has taken me about an hour, which gives you an idea how much time this beast has eaten. On the bright side I am apparently much more relaxed and easy to get along with when I am working on it. I did a talk recently for a group in Stone where I was asked several quite interesting questions but one that really got me thinking. I was asked how designed my quilts are before I start making them. The answer was it depends. I might start with no very fixed idea, or I might know where every stitch goes or anything in between. That is a true answer but it really only gives you a flavour of what I mean. I posted a lot about the process of my latest art quilt 'Quiet Moment', and I mentioned printing three versions of the reference image before I got one the right size. Before that there had already been quite a lot of design work, some formal some less so. First there had been talking to the model, then she selected some images she was happy with. I look at those images and see which ones 'talk' to me. I don't see any point in working with images that leave me cold. At best I won't do them justice, at worst they won't touch anyone else either. Once I have some images I like the look of I start playing with them on the computer. 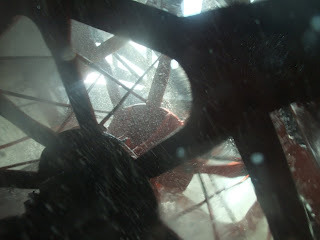 I'm looking for shapes that offend me, and details that can be misread, be it through shape, or shade. Only after that can I think about producing the reference image. My first thought it that as they follow an image pretty closely these are probably my most designed quilts, but maybe they are just the most formally designed, with paper and everything people think of when you say design. However they evolve a lot as I work on them. If you go back and compare the images of 'Quiet Moment' you will notice many little edits as I went along. I also don't think that much about the quilting until I get to that stage so really these quilts are somewhere in the middle of my planning scale. 'Leather feathers' is one of my least planned quilt. My whole idea when I started it was to sew on leather. Yup really, that was it. Once the hide was loaded onto the frame I thought about the thread. Black to hide errors. Only then did I wonder what I was going to quilt. A bit of hand waving and it got feathers. The big one across the middle came first then the others just sort of filled it in. Maybe this isn't the way you are supposed to make quilts, but if it works it ain't daft. 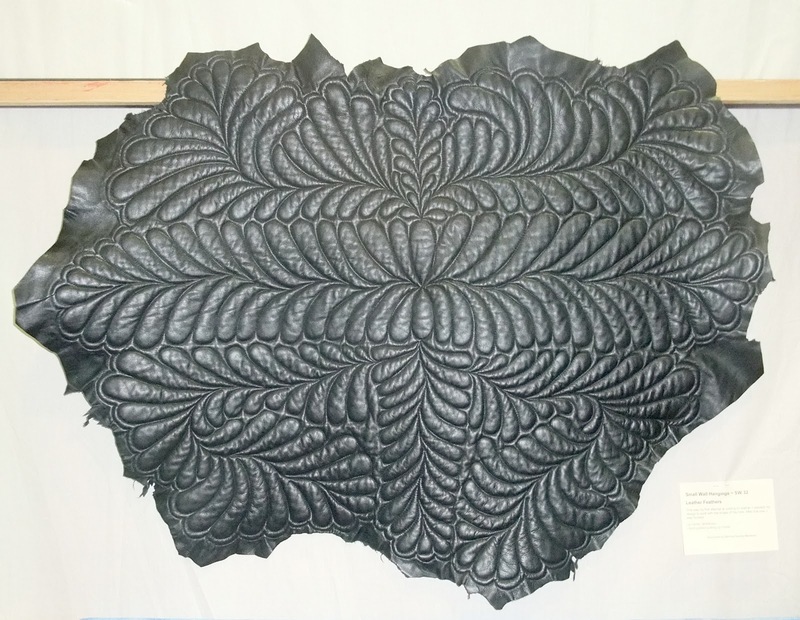 The next leather quilt and indeed most of my other whole cloth quilts did have a little more planning. Usually I design the straight lines which make up the pattern and I only worry about the colors and stitch patterns when I actually get to the machine. 'Phoenix Rising' I would say is my most carefully planned and designed quilt to date and yet there is very little on paper to show for it. 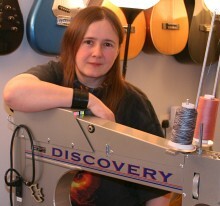 This is where I seem to really diverge from most quilters (or at least the ones who talk about the process they use). I mostly plan in my head. Partly because I can't get down on paper what I can see in my head, and partly because I don't see the need to. 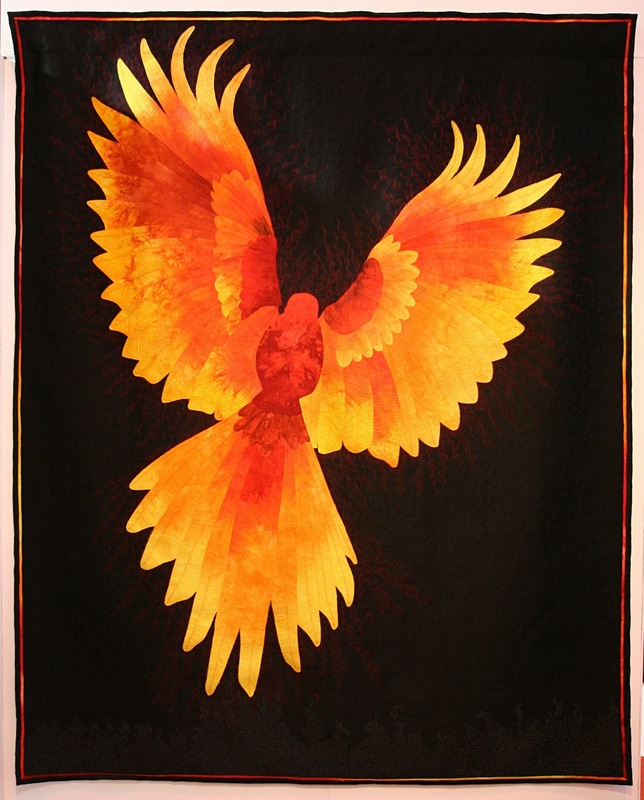 I started off just knowing I wanted a quilt with a phoenix on it. That's tricky, you don't see many of them flying about and I am not good at drawing. On my drive out to Hemel Hempstead I see a lot of magpies though and I quickly realised they were the right base shape for my phoenix. Having solved that problem I could think more about the other details of the quilt. 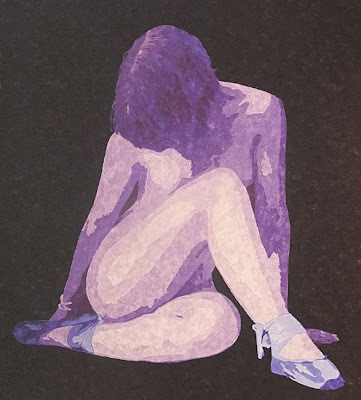 I spent a lot of time considering the pose, I'd have liked it to be more diagonal on the quilt but I couldn't get the aspect ratio right so it straightened up a bit, in my head over the space of certainly weeks if not months. I found fabric that read like flames and ordered it. I lay in bed at nights planning how to make and quilt the feathers of the wings. How to mark the background to get the applique in the right place, what size the quilt would be. The hardest task was the background. I could see a cityscape and I even planned that with it's applique and quilting but it wasn't right, and I knew it. It took at least eight months of play around before I settled on plain background with just the ashes quilted in. By the time I came to make the quilt I knew exactly what I was going to do. It was just like having a pattern to follow and it is exactly as it was designed, right down to all the quilting and the binding, but what design work do I have to show for it? A few photographs of magpies, and couple of printed reference images. That's it. Some quilts do get a bit more work on paper. Usually so I can check the maths out. 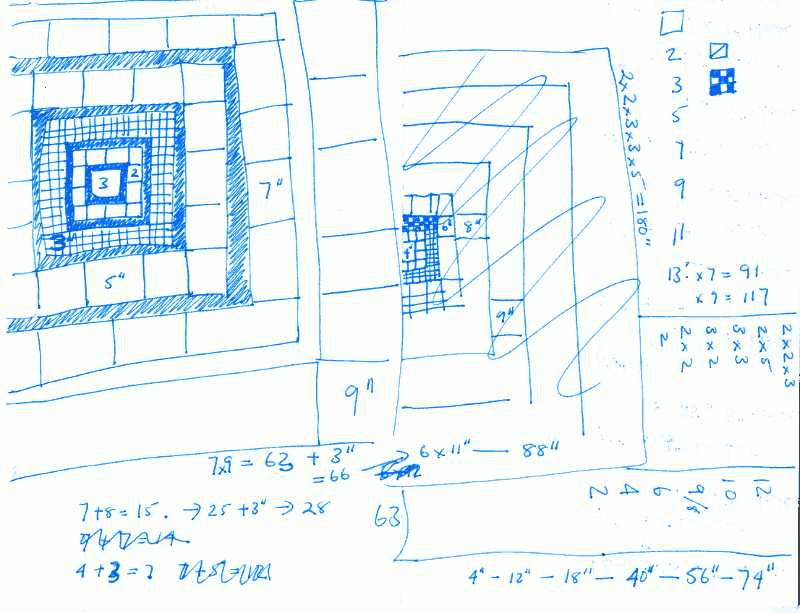 I think my most common sketch is a series of concentric squares or rectangles with numbers on. Down the side you will often find a list of numbers. The image is the first one I could find on my desk. It's on the back of a letter, that's pretty normal for me too. I write on whatever comes to hand when the idea strikes me. This is pretty typical of my sketch books, pages and pages full of numbers. I suppose they really look far more like maths books than sketch books but it's how I work. Greek Fossils started life like this. 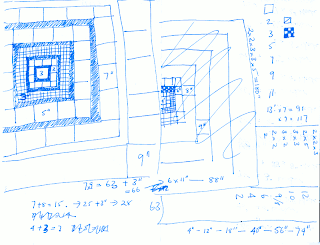 just a few concentric rectangles and some numbers. In fact so did Prometheus, my new monster wholecloth, although that did gain some diagonal lines in the middle. 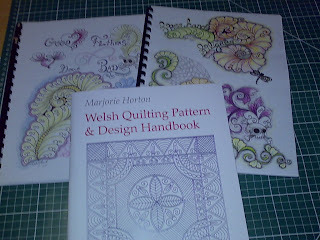 So that's how I design my quilts, I hope it might inspire others who can't/don't/won't draw to have a go at design. You really don't need lots of art tools to design quilts (though they can be fun sometimes too). My students have become very adept at reading my design sketches, and I've noticed some of them starting to use a similar techniques for working things out. Most of the time quilts don't need a lot of details to get you the information you need. I might go from this sketch to sketches of the blocks in the quilt which would then have their cutting requirements with them. For very simple things I don't bother, I just need to know what sizes I should have at important points. Sorry if this disappoints the folks with the beautiful sketchbooks, but they don't work for me, this is how I think. I kinda wish I did produce the fancy prep work, but at least I can make the quilts. Just a quick post to prove I survived the day. There are some mysteries of the world I will never understand and seem doomed to forget before they hit me again. Why is it that traffic is always worst the first classes in September. I could almost understand it if the shop term started the same week as schools but it doesn't. Even then it's a bit of a stretch. Surely there are the same number of children going to school and about the same number of cars taking them, therefore the same amount of traffic. So why is it every year the last two weeks in September always have worse traffic, and why do I forget until it happens again. It's just weird. At least I left plenty of time today and I do know it will settle down fairly soon. It was good to catch up with the returning students and see what they had achieved over the holiday. Looks like one of my regulars is hooked on hand applique so I guess now is a good time to start designing some. I've been putting it off as I just can't do that much hand work, but she can and it looks like she is going to get really good at it. It was also the first chance to meet new students and find them projects to work on. I'm looking forward seeing my book quilt made up in latte colours. It's going to be very subtle but I think it will also be quite stunning. That's the upside of a new term, lots of new possibilities. Having finished my lesson prep for tomorrow (a new pattern for some of my evening students to play with) I think I had better get to bed. I need to be recovered from today before I get tomorrows set of questions in. I wonder what other new projects will appear then. I've just heard from the printer that I should have the calendars by Thursday morning. I will try and get them up on the web site as soon as possible, in fact by the time you read this they will probably be there in my web shop. 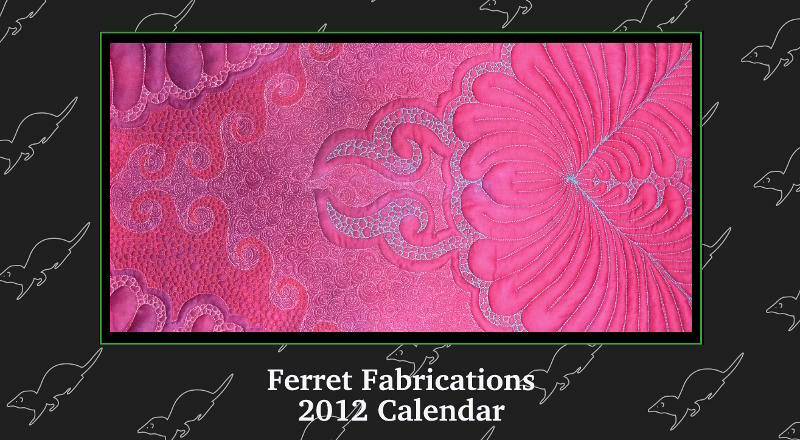 This year they are desk calendars and will be selling for 6 pounds each. As usual it's a limited run and when they are gone they're gone. I hope you will all enjoy them, they are have couple of new quilts in them. The cover is a close up from my new wholecloth, Prometheus. 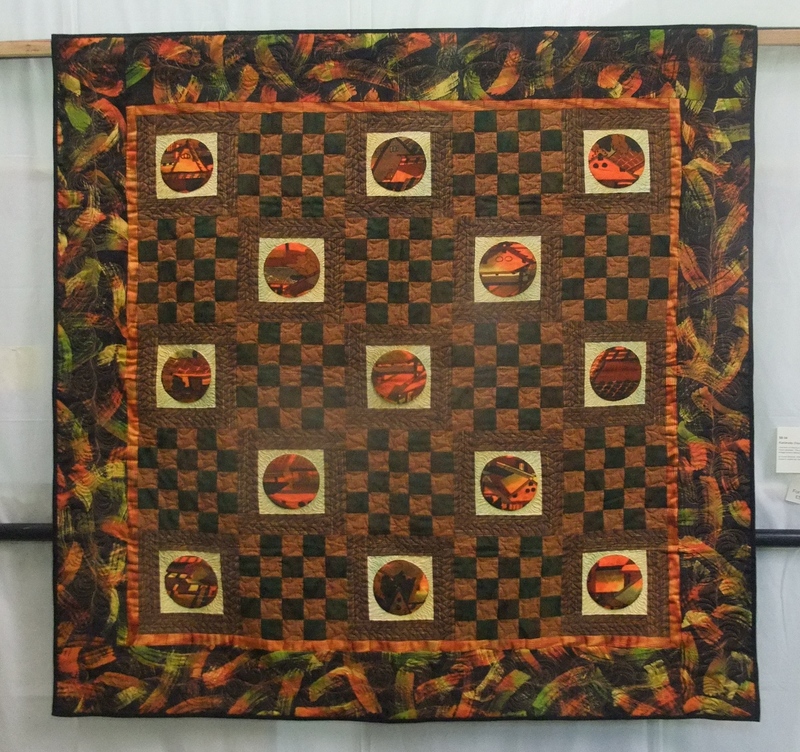 They also have several quilts that you may not have seen before. Some time ago, Tet decided he wanted to go for a driving day for his birthday but it turned out to be harder than we expected to arrange. We had to buy a voucher from one company, wait for it to arrive and then book with another company, who had no useful dates. Over a year later the only date we could get clashed with a race weekend but we decided we had to go for it anyway. 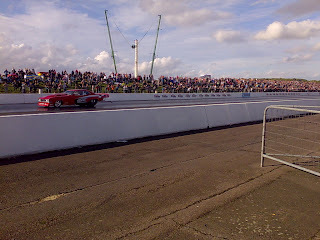 Of course the venue isn't that close to Santa Pod and we were having a very early start so to make things easier we drove down to the nearest services on Friday night and stayed there. The experience is run on an airbase, mostly on a run way with the circuit laid out in cones. For me that wasn't great, I found spotting the yellow cones in the sea of orange tricky but after a few laps I knew where the corners were and it was less of an issue. We were booked to drive three cars, an Aston Martin, a Ferrari and a Lamborghini. I was put in the Aston first, which was a bit of a shame as really that was the one I was most looking forward to but I had long enough in the car to get to know the circuit. It may have been the heaviest most armchair like car there but I loved it. It does however have terrible visibility. Nice and solid, yes, but huge windscreen pillars. From there I went on to the Ferrari. I don't think it really worked for the track they had set up. It is very tame at low revs and there just wasn't enough room to really get it up to speed. It is very solid in corners, again in this environment perhaps to much so. I can see why the instructor says it is the most rewarding car to really get to grips with but it takes more than a few laps on a short circuit, so really it did nothing for me. Perhaps if the cars hadn't all got extra silencers it might have at least sounded good. By this point we had decided it was enough fun to be worth booking a few more laps. Tet went for a Porche and a Mitsubishi and I added the Lotus and Subaru. The Lamborghini I really wanted to like, and for the most part I did. Both of us were shocked by how slow and jerky it's gear changes were. It has flappy paddles and man do they look cheap and tacky, but there is a very long delay between you asking for the change and actually getting it. I really hope this is just a feature of how the centre have their car set up. Like the Aston visibility is poor, but not to the point of being a problem, more something to be aware of (the Capri can hide an articulated lorry so I can't really complain). It's real issue is that you are going faster than you think. The instructor did stress that if he said brake just do it the speed is deceptive. OK, first significant corner I brake, then more then he asks for a lot more brake. It felt like I could have got out and walked, so I asked if the car just didn't handle well in corners. No, he insisted I was gong faster than I thought. Hmmm, OK, but it didn't feel very quick. I checked the speed the next time we cam around, at the point I would have said we were doing 30 ish, it was 70 ish. Ouch. The car is lovely in corners, but man you need to watch the speedo. It won't even notice you losing your licence. I'd love to try another one just to see if the horrible gear change is just a feature of this specific car. My next drive was the Lotus. Other than having the monopoly on door sills and the most painful seat, I loved it. It was just so much fun to drive, quite indecent given how much cheaper than the others it is. Were money no object I would love an Aston but bang per buck the Lotus really beats them all. I am quite certain the seat could be changed to one that didn't bash my hips about like this one did. The Subaru was a car I wouldn't have gone out to drive but as it was there I wanted to see what the fuss was all about. I'm none the wiser. I spent most of the drive home trying to come up with a positive about this one, and my best offer is you can probably carry more in it than any of the others, but if load capacity was the thing I was after I'd be looking at a Transit van. Apparently most people like the easier clutch, brakes and gearbox. I hadn't noticed the others were hard. There was a large notice in this car warning against rushed gear changes and it wasn't kidding. I found I had to be actively slow changing gear. Yes it's gates were easier to find than the Ferrari but the slow motion changes were just frustrating. I'm also very used to rear wheel drive cars and they drive very differently to a four wheel drive vehicle. To me it seemed to need a lot more babying than I would have expected to get it round corners. Maybe it should have been at the drag strip. It was a very fun way to spend a day. I really enjoyed getting to play with all the different cars. I will be keeping an eye open for events where I can spend longer with some of them. They say this is designed as a taster day, and that's a really good description. The problem is, once you've had a taste you want more. This post is a little delayed due to lack of power, but Saturday was all about cars. 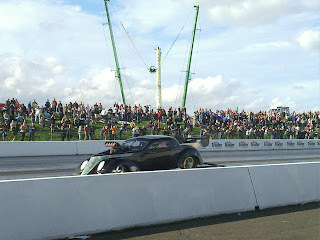 We spent the morning at a driving experience and then went back to the drag strip. We made it back just in time to see a pro session which was great. The rain help off just long enough to run the promods. 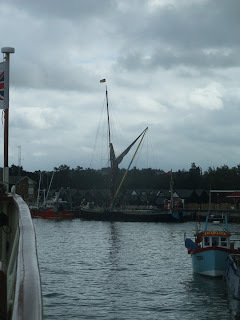 I'm sorry the photo isn't great but as ever I was working with my phone for blogging. I am so thrilled tohave seen Red Victor 3 making runs this weekend. Not only that Andy Frost has now completed his licencing. This is a really special promod as it's street legal. Number plates, MOT, tax disk, the whole thing. He not only has lights indicators, horn and windscreen wipers but also electric windows in a race car. When it's run in (yes he is running it in by racing gently) it will be a 6 second car. That means from a standing start it will cover a quarter of a mile in 6 seconds, that's very quick. For comparison my car is running 17 seconds. Right now top fuel eliminations are about to run so I'll leave this here. Maybe eye candy would be a better description given the books are all mostly illustrations, but they serve the same function. They are all books I've been looking at for a while and they all arrived this week. 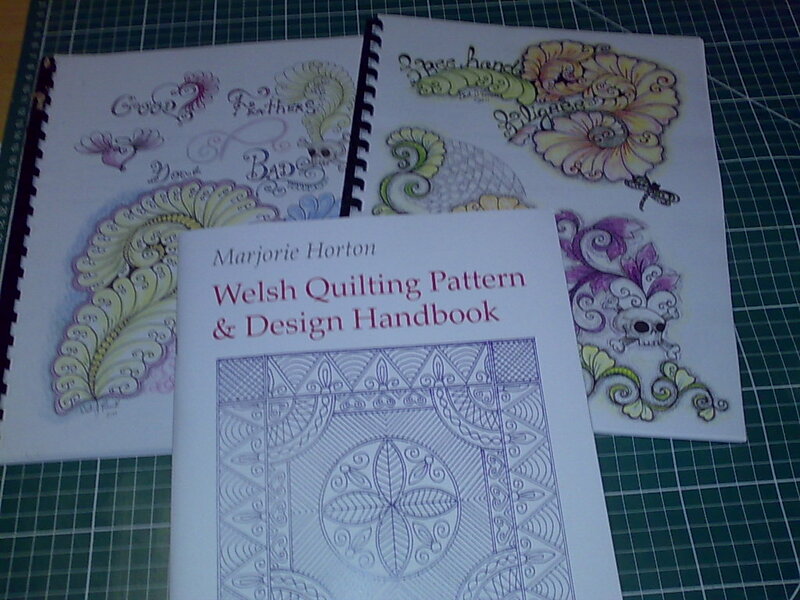 The Welsh quilts book is research for a wholecloth idea i have which will also become a class, but the other two are pure fun. I've seen an lot of Dusty's work and I wanted a better look at some of his patterns. They are very good books, my only complaint is that he says a lot of the same things I do thus making my quilting book harder to write. I'll let him off, not only did he get it to print first I think most of it will bear repeating. I was especially pleased to find out that he quilts one handed too. I completely agree with him that it's a lot easier, and that the key to quilting is body memory. Some of the patterns will be fun to play with too. Guess I should go, desert has arrived. 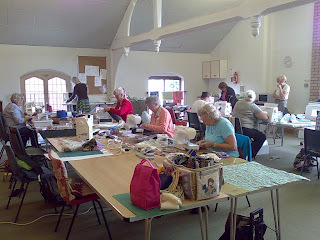 Today I was teaching 'Autumn Leaves' to some of the ladies from Cosby quilters. They are a fun group with a lot of ideas. I think these ladies will take the ideas from the class and play. In fact I know they will because they were already doing it. I hope they will send me so updates on how the experiments pan out. It's also given me some ideas I would like to play with at some point. I really like it when suudents ask why, and especially when they ask it about things I might not have fully considered. These are two quilts from Susan Briscoe's special exhibition at the show. The show is quilts from her book, Japanese Quilt Inspirations. The first one is called Furoshiki'. It's a quilt I quilted for her and is now for sale here. It will be coming back to me for a bit more quilting before it goes to a new home. When I quilted it initially we were on a very tight schedule and it had to go back for photography before I was completely happy. 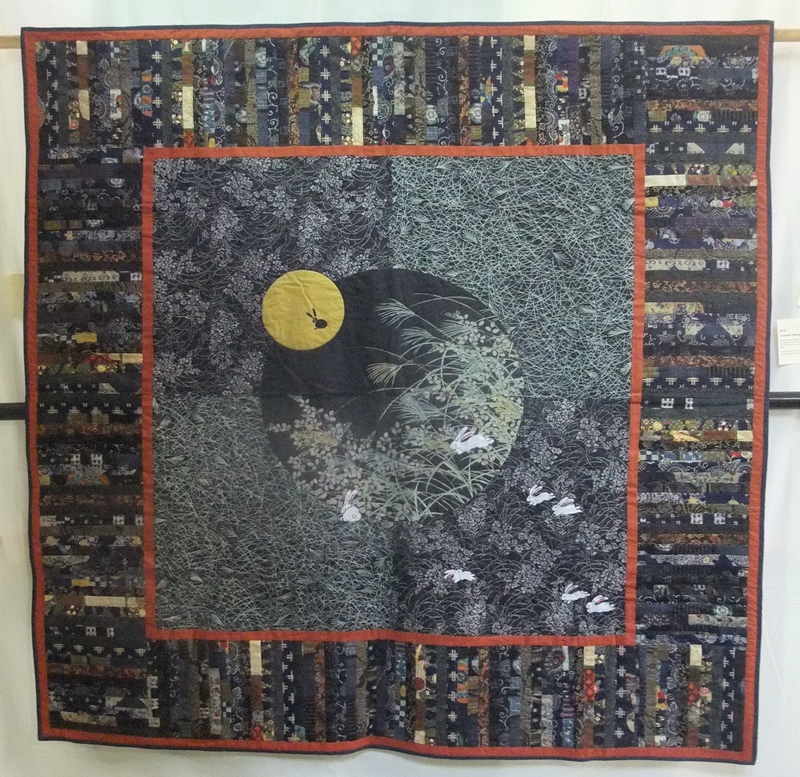 The second quilt is called 'Kunimoto', and is also up for sale. 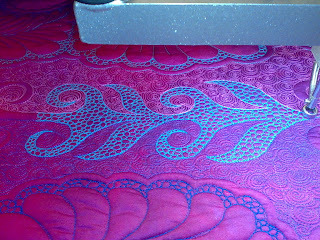 This one was interesting to quilt the border is a very slinky fabric, which looks good especially when it's quilted but man does it try to wriggle. 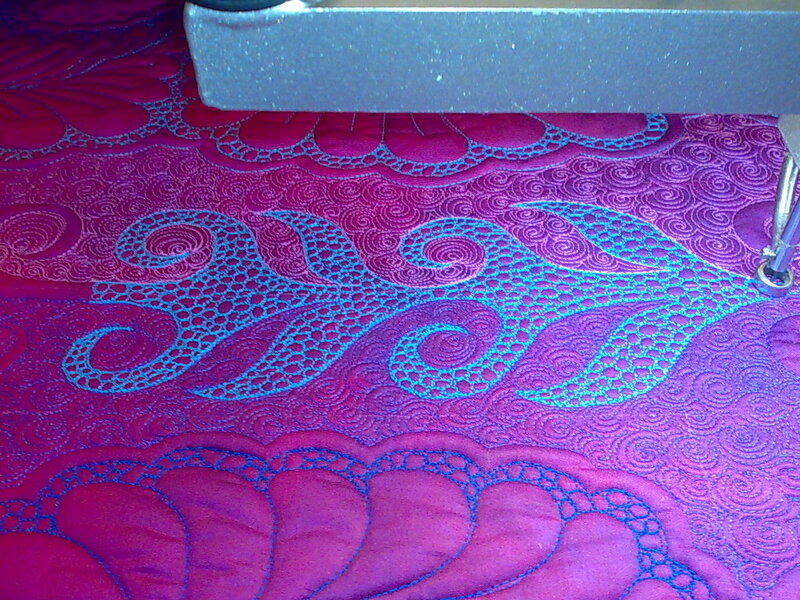 I did really enjoy working on this quilt though as it had a lot of different textures in it. I like quilt where you feel the different fabrics as you quilt over them, but then, to me, quilting is all about making things that are tactile. 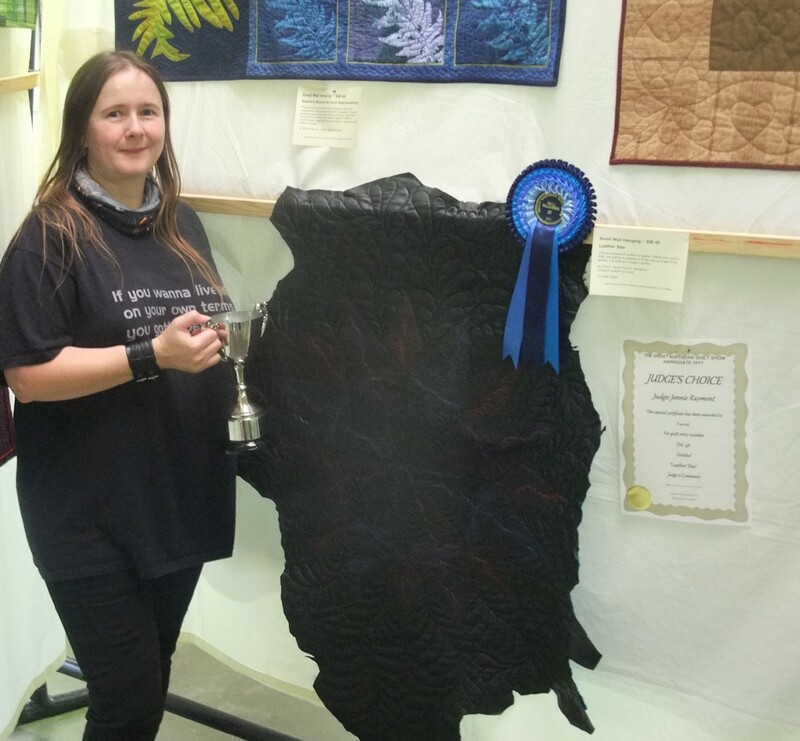 It's not often I am so pleased by the judges choice of Championship quilt, but this year there have been two winners that really pleased me. Unfortunately at Sandown one of those beat this one, but all's well that ends well, it's made it this time. 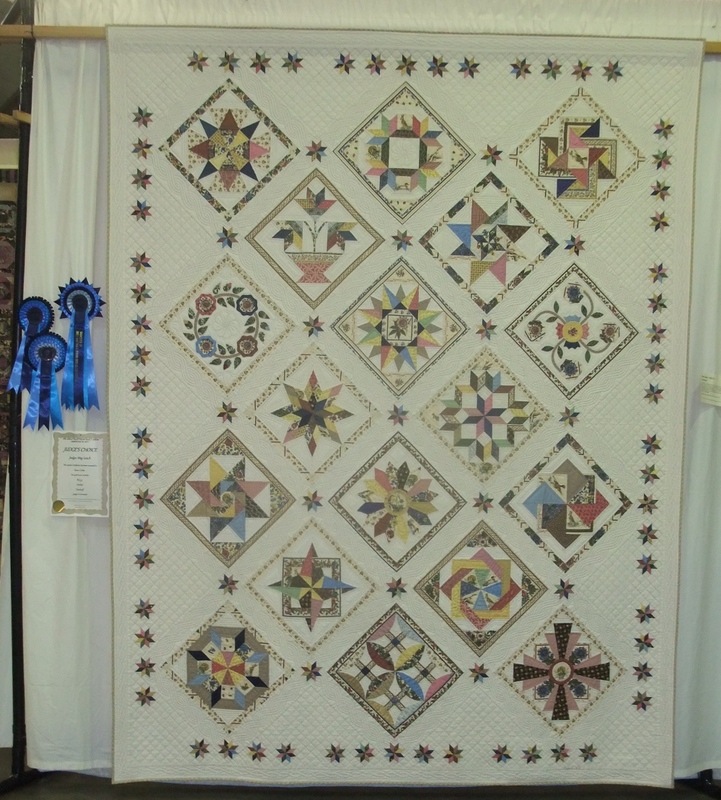 The quilt is called 'Overleaf' and was made by Susie Corke. I just love this quilt. 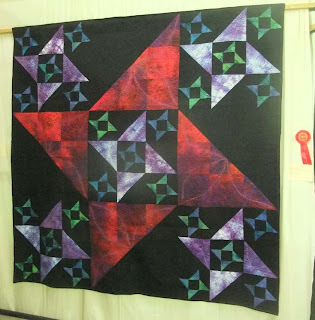 I'm a sucker for stars anytime and small beautifully pieced ones are even better. I'm also a huge fan of sampler quilts (hence Ferreting Around) and on point settings, especially when I don't have to quilt them. The photo really doesn't capture the detail of this quilt, you'll just have to take my word for it, the piecing and quilting are both lovely. At Sandown we saw this quilt before we saw either the second place or winner of the bed quilt category and our initial response was it should have been the champion. It turned out there was a glut of exceptional bed quilts this year there. The spiky rosette if the champion quilt award, one of the others is first place in bed quilts and I think the third one was for hand quilting but I may be wrong on that. The certificate is a judges choice. I hope this quilt will be displayed again somewhere. I would love to see it again and I'd love as many people as possible to have a chance to admire it. I'd love to make a quilt like this at some point, but I'm not sure I have the patience for it. 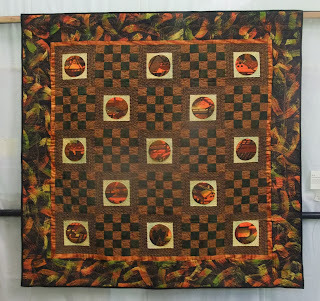 There are more pictures of this quilt on Susan Briscoe's blog here. Here are my quilts from the Harrogate quilt show this weekend. It's the first time I have entered this show and as I was lucky enough to pick up an award it was also my first visit to the show. It is a bit of a trek from London to Harrogate so we set off Saturday evening and stopped at a services for the night. As we are both night owls it really makes things a lot easer for us. After a gentle Sunday morning drive we arrived at the show about lunchtime. Perfect. It's a lovely area and I would very much like to spend a day or two exploring the area at some point. Before setting off I had checked on the location. 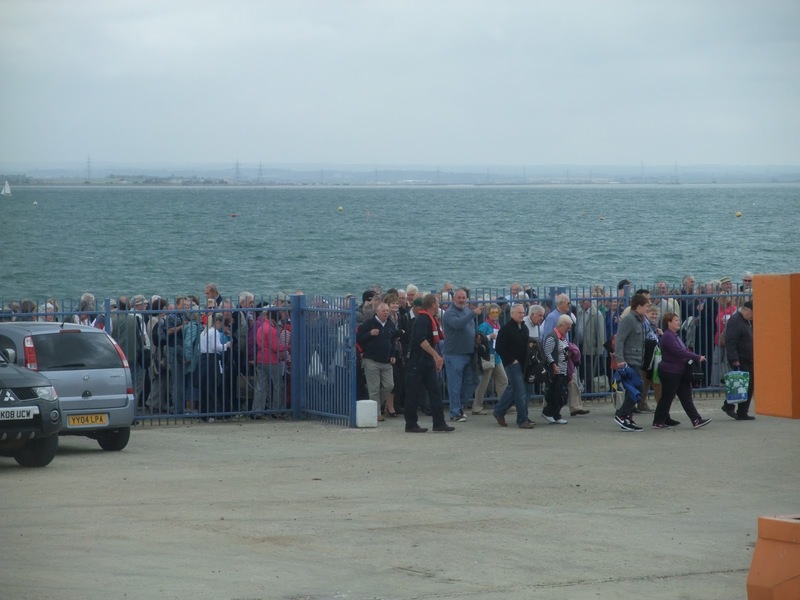 The show organisers mention that the entrance is a fair distance from the main road. They aren't kidding. On the other hand there is a Sainsburys with a petrol station at the entrance too, handy after a long trip. On route to the quilt show I noticed there had been a wool craft show on the Friday and Saturday, which I would have enjoyed, I wonder if it is an annual feature? 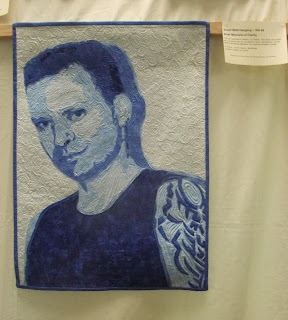 The first two of my quilts were in the Bed Quilt category. I really didn't think either of them would have a chance of an award here as I had heard this is a very competitive show so I was really pleased to find that Ferret Fractal Stars had picked up a Judges Merit award. The other bed quilt I put in you probably remember, it's Holiday Starrfire. It's my interpretation of Starr Fabrics Starrfire kit. I made it as a holiday from quilts I needed to think about with the intention that it would go on my bed last winter. I had been thinking this might be it's last show so I could use it this winter, but then it was invited to a show in France. So I guess I can wait another year. If it's going to be around for another year I may see if it can go anywhere else too. My other two entries were in the small wall hanging category. This is a great category when you need to ship your quilts to shows, you can send smaller lighter quilts :) See I do sometimes think about the shipping problems. The portrait is "A brief moment of clarity. It is of a friend of mine who is also the writer of Cancertown, the graphic novel that inspired the quilt "Bad Rain". 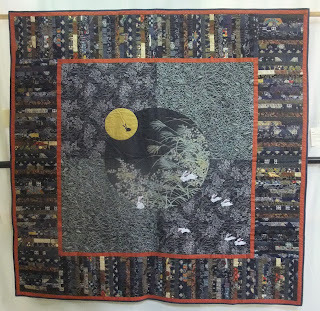 I had hoped this might picked up and award but I had forgotten it wasn't in a specific art quilt category, that does make a difference. It did also mean the small wall hanging category was larger than I would have expected. 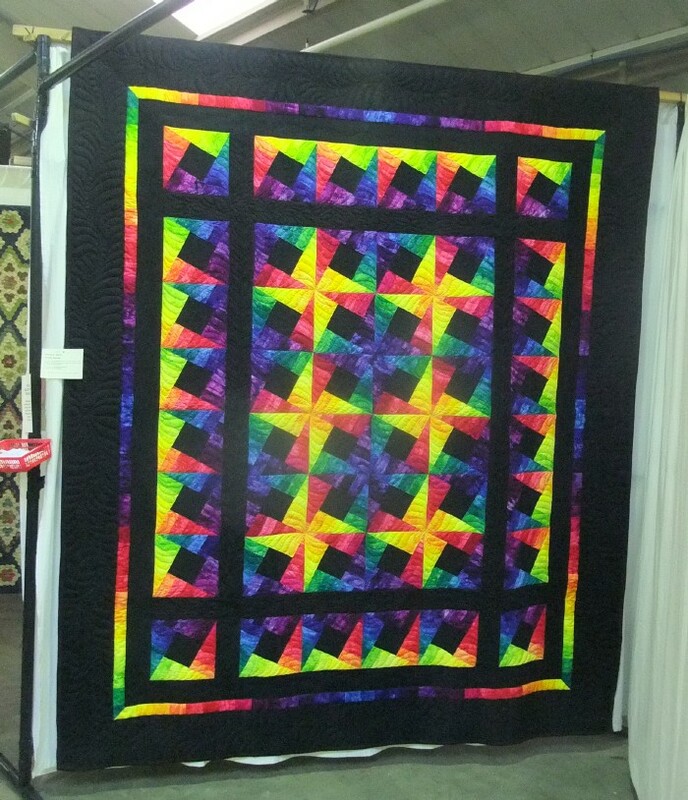 Finally there is the quilt that brought me to the show. 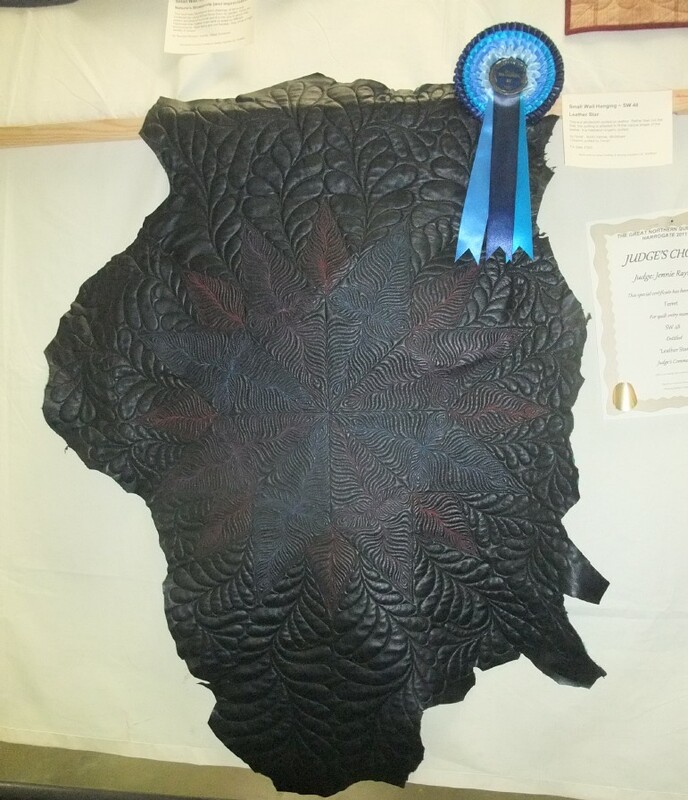 "Leather Star" won the small wall hanging category. It was great to see it there with a ribbon on. They are really nice ribbons too. In the UK they are colour coded by show not by where you place in the show. I love these shaded blue ones. The certificate next to it is a judges choice award from Jenny Rayment, thank you Jenny. Thank you all for your help, it's been much appreciated. After much discussion and chasing down all the suggestions that came in, three of us have just sat down to name the quilt. Tet, the model and I each chose our favourites. Of course we didn't pick any one the same so some negotiation took place. After some entertaining mistypes we realised some titles I can't be trusted with so we went for simple. The quilt is now called, Quiet Moment. I found it really interesting the different things people saw in the image, it's something I really love about making art quilts. They go and talk to people in so many different ways. 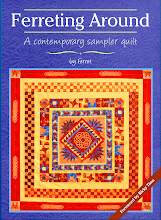 I do love the idea that this quilt is linked to Wait, and this title works in with that idea. There were some titles suggested that may appear later. I have some other pieces in the planning that we think they might fit rather well. Now Tet can get on and finish the calendar, which was the critical job. I am really look8ing forward to that now. We've just got back from Harrogate quilt show, which I will post about tomorrow, but for now I think it's bed time. Why did they put Harrogate so far away? 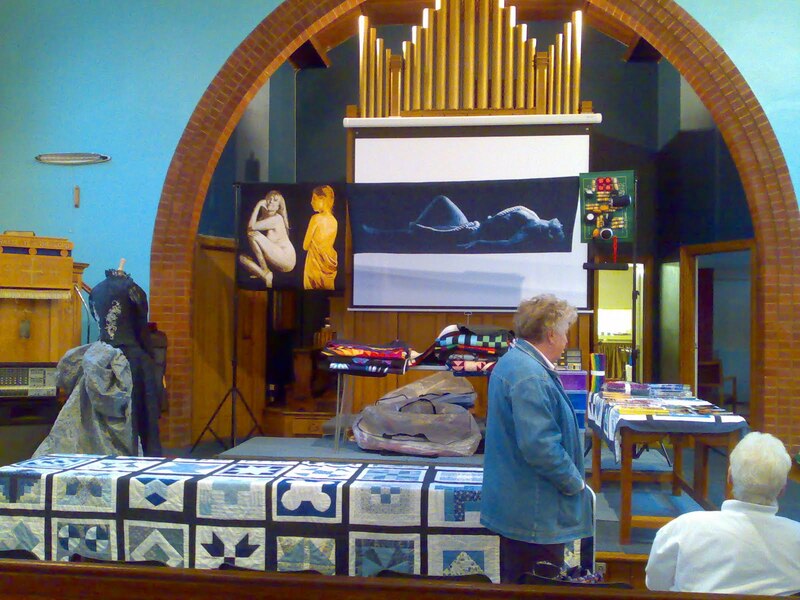 I've just realised the art quilt needs a name. Urgently. I am producing my new calendar and it will be in there, so it needs a name by Monday when the calendar has to go to the printers. I may work well under pressure but I'm not so good at naming things that way. So, can you help me please. Here is the finished (well almost it's not bound yet) quilt, what should it's name be? Please leave your answers in the comments then other people can share what they think of the current suggestions. I names one of my other quilts like this and that worked really well so I have high hopes for your creativity. Please feel free to share this link and see if anyone you know has any ideas. It's been a while since I worked on my van project. It will be a king size double wedding ring quilt one day. Today I have just completed another batch of arcs. I think that makes 44 out of 163 in this colourway. Now I have a dilema. 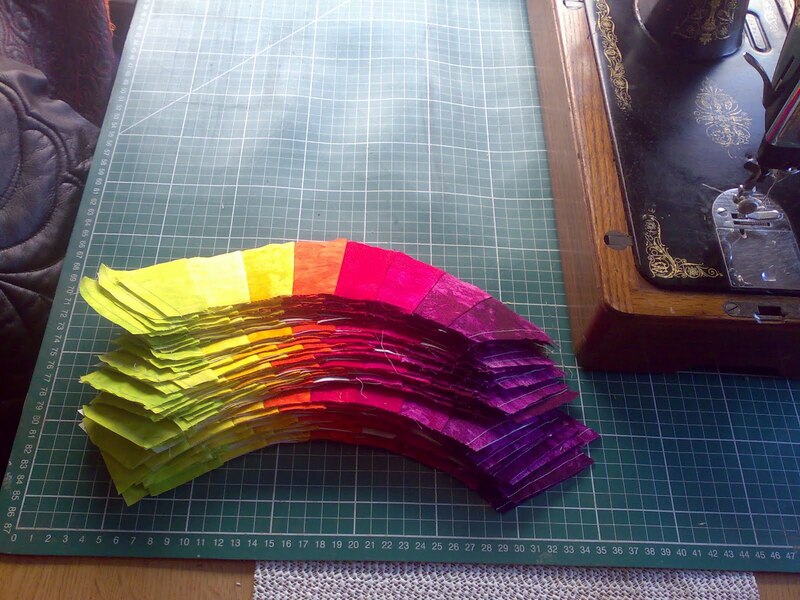 Do I do another batch of this colour or try to do some of the other arcs. If I did the B arcs I would be closer to putting something together, but I would have to think about where the colours go, and I think it will need a lot of cutting which is easier without the talk in the van. I guess it's more A's then isn't it. Oh well at least it's progress. I'm due to give a talk tonight in Stone. It's quite a posh venue, 2 halls and a few other rooms. There's a good size car park too. Fingers crossed for a good night.